After a thorough search of the modern market, we have placed ourselves as the leading manufacturer and supplier of RTD Sensor. These RTD sensors are used to measure temperature by correlating the resistance of the RTD element with temperature. Offered RTD sensors are obtainable with us in various specifications as per the requirements comes from the clients. In addition, these RTD sensors are inspected properly by our experts upon distinct parameters of quality. Founded in the year of 1985, we “M.r. Enterprise” are a leading firm of the industry involved in manufacturing and supplying an attractive assortment of Heating Elements. 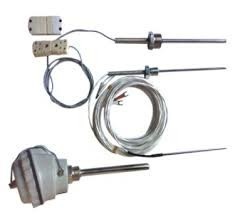 Our product range includes finest quality Industrial Heaters, Industrial Cables and Thermocouple Cables. Our offered range of product designed and crafted by consuming finest quality components sourced by the trustworthy and certified vendors of the market. All our offered products are designed in compliance with the modern market trends and developments by employing progressive technology. Offered ranges of products are highly demanded by our clients for their strong construction and excellent finishing. We are offering these products at industry leading price. We are listed among the top list company in such short span of time, because of our qualitative assortment of products. To manufacture and designed these products as per the industry approved parameters, we have construct a modern infrastructure facility at our end. Our facility is equipped well with the upgraded tools and machines. We are also supported by our highly efficient and talented workforce. Owing to our distribution network, we have been able to deliver the offered products timely.